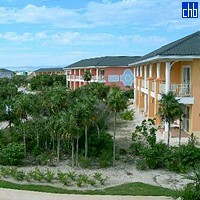 The newish (2006) Las Dunas Hotel is the most upscale of the Meliá group's three Cayo Santa María properties. 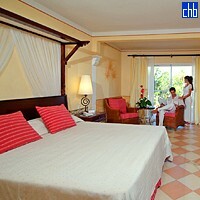 This visual stunner rivals deluxe all-inclusive resorts elsewhere in the Caribbean, at least in ambiance and decor. The setting, of course, excels. The pristine white sands here are stupendous, as are the turquoise waters, although there is very little shade. The grandiose lobby, with its open plan and reflecting pools with fountains, sets the tone with a dramatic welcome. The architecture is part Caribbean, part Oriental – a colorful fusion is both literal and metaphorical sense, as Meliá's trademark blues and tropical pastels add a lively element. 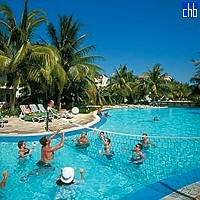 This five-star resort is mega-sized, with 925 air-conditioned rooms, of which 19 are suites. All offer an endearing decor, highlighted by two-tone ceramic floors and harmonic use of either blue-and-white or rose-and-white subdued color schemes. Dainty wrought-iron and rich hardwood furniture harmonize with deep-cushioned rattan lounge chairs and sofas. You don't want for amenities, as satellite TVs, telephones, minibars, coffee-makers, in-room safes, and irons and ironing boards are standard. All very elegant! The resort is built around a vast serpentine swimming pool with spacious sundecks, and the range of amenities here is hard to beat. Hotel Las Dunas has an extensive selection of bars, including the Lobby Bar, the Snack-bar and an Aqua Bar at each of its two swimming pools, the Beach Bar and the Beer Garden Bar. No less than seven full-service restaurants ensure that guests will find something they like. There are two buffet restaurants: one International and another Cuban in addition to the more specialized: Steak house, Mediterranean, Italian, and Beach Grill. There's even a Coppelia ice cream bar. 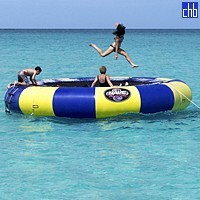 You can work off the fat with activities from aerobics and basketball to aqua bikes and tennis. And the spa here is first-class. 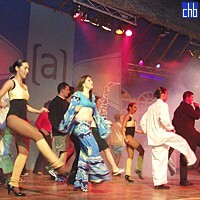 Furthermore there is a discotheque, an animation room, massages, Jacuzzis, an activity club, a sports area, a baby club with a play area and its own swimming pool, and a convention room. Rooms are spacious, artistically designed and decorated with ornamental motifs that combine traditional elements of Cuban culture with the proverbial luxury and comfort. Cayo Santa Maria leží na západním konci Archipielago de Sabana-Camaguey, 25 km západně od Cayo Guillermo, v ekosystému Bahia de Buenavista, který UNESCO prohlásil za "biosférickou rezervaci"; v prostředí bohatém na endemické druhy chráněné plážím nesrovnatelné krásy, s více než deseti kilometry jemného bílého písku a mořem různých odstínů modré. Klíč (cayo) je spojen s pevninou impozantní promenádou nazývanou "El Pedraplen" postavená přes Bahia Buena Vista z přístavu Caibarien za cenu 100 milionů pesos. Tento inženýrský zázrak postavený v letech 1989-1999, je dlouhý přes 48 km a má 46 mostů a je hoden svého ocenění Puente Alcantara. Mosty umožňují výměnu přílivových vod, zlepšení oproti dřívějšímu Cayo Coco. Dláždění bylo dokončeno v roce 1999, stejně jako letiště Las Brujas bylo postaveno na Cayo Las Brujas, 45 km severozápadně od Caibarien. Cestovatelé z Remedios, koloniální město s parrským kostelem a Santa Clara, sídlo památníku Ernesto Che Guevara, překračují krystalické a klidné vody a klíče a mohou pozorovat jestřáby, pelikány a úžasný růžový plameňák.